Iain Moody has resigned as Crystal Palace sporting director. It follows allegations he shared racist, sexist and homophobic texts with former Cardiff boss Malky Mackay. The pair were sacked by the Bluebirds last season and the Welsh club sent a dossier to the Football Association alleging misconduct. "In light of the events, Iain Moody has tendered his resignation and it has been accepted with immediate effect," read a Crystal Palace statement. The claims, reported in the Daily Mail, have already ended Mackay's chances of becoming Palace's new boss. He had been the favourite to take over at Selhurst Park. It would have been his first managerial role since his dismissal by Cardiff in December. Moody, Mackay's head of recruitment at the Welsh club, was sacked two months prior to that and later joined the Palace staff. Smith told BBC Sport's Natalie Pirks that he was disappointed by the content of the alleged text messages but said anti-Semitism was not a problem facing just football or British society. "The anti-Semitism feeling around Europe is frightening," he said. "The FA and the powers-that-be have a job on their hands and we have got to give them every help we can." While the FA investigation into the allegations against Mackay and Moody is ongoing, Lord Herman Ouseley, chair of anti-racism group Kick It Out, says the game must address discrimination but recognises it is difficult to eliminate "prejudices, bigotry and even hatred".He explained: "What you see at face value is not always reflective of the attitudes which are actually held deep down. It's easy to present yourself as being reasonable and fair. However, any in-depth forensic examination or analysis of hidden views would be likely to reveal otherwise." After manager Tony Pulis left Selhurst Park last week, Mackay had been widely expected to rejoin Moody in south London. 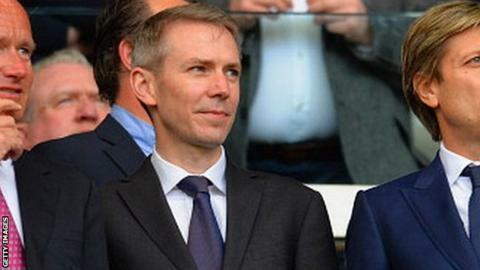 The FA has confirmed it received a detailed account of issues relating to the pair from their time at Cardiff and said it was "investigating". BBC Sport understands that the FA is placing no timeframe in their investigation into Cardiff's allegations about Mackay and Moody. The FA's governance investigatory team will begin work immediately to establish facts, understand the context and form a clearer picture. Only then will it be able to take a view on whether or not it is in a position to act on the situation. Cardiff, Mackay, Moody and Palace have so far not commented on the latest allegations. The Bluebirds have also given Palace and Moody notice they intend to serve legal action against them for their involvement in last season's so-called 'spygate' incident. The Eagles beat Cardiff 3-0 in April only for the Welsh side to complain that their starting line-up had been leaked to their London rivals. Palace and Moody denied any wrongdoing. It is understood that the Palace hierarchy were unaware of Cardiff's latest allegations about Moody and their complaint to the FA until Wednesday. Palace are also thought to be unaware of the allegations about Mackay when he was interviewed for the vacant manager's position on Sunday. Mackay was a strong candidate for the role until Palace learned full details of the allegations on Wednesday and immediately withdrew their interest in the Scot. Palace were led to believe that the bitter dispute between Cardiff and Mackay and Moody had been settled when the pair apologised to Bluebirds owner Vincent Tan in May and dropped their claims for compensation over their sackings in late 2013. The prominent women's football networking group, Women in Football, reacted to the allegations, commenting "WiF calls on the football authorities to review their current equality and disciplinary procedures and act decisively to implement a more robust and transparent process to deal with all allegations of discrimination and abuse in our national game." Meanwhile, Palace's hunt for a manager is likely to extend into next week. Keith Millen will remain in temporary charge for Saturday's visit of West Ham, assisted by first-team coach Ben Garner and coach Gerry Francis. Former Tottenham manager Tim Sherwood is one of the candidates to be appointed to the position on a permanent basis. Oct 2013: Mackay and Tan hold a five-hour meeting amid rumours that their relationship was becoming increasingly strained after Moody's departure. Dec 2013: Mackay is sacked by Cardiff City following a 3-0 defeat against Southampton. Cardiff were 16th in the Premier League, one point above the relegation zone.